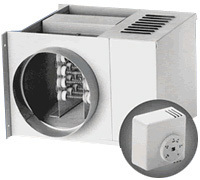 We regularly stock Thermolec model "TER" and "ZON" duct heaters! Thermolec has been the supplier of choice for contractors and OEM's since 1973 because of their level of service. Thermolec designs and manufactures electrical heating equipments, modulating controls and residential humidifiers. Their products have been shipped throughout the world from their two manufacturing plants where ongoing employee training and quality programs ensure the highest level of customer satisfaction. The most recent technology is developed in their R&D center to their unique and patented AIR FLOW SENSOR technology, which is used in a vareity of products. Continuing research, coupled with their skilled and experienced design engineers helps make their products trouble-free. If you are looking for a different Thermolec product, just let us know and we can certainly order it for you.